Just some of the things on my fridge door. There is one door in my house that I affectionately call the "Door of Awesomeness" and that is the fridge door. Everything goes on there. Fridge magnets that I love, photos of my kids and grandkids before I put them in frames or the photo album, but mostly it is covered in quotes that I love. I am a wordy person and I have been collecting quotes for as long as I can remember. I collect them in note books and scraps of paper. I have folders full of the ones I have printed out and I always have some on the fridge. Always. That is until a few weeks ago when I was doing a big de-clutter, spring clean ( even tho where I am we are moving into Autumn!). In a flurry of domesticity and a desire for a more zen like calm in the house, I stripped the fridge door bare... and left it like that. For about a week. There was the fridge door in all its stark, stainless steel glory. All shiny and gleaming. But it didn't feel right. Worse, it didn't feel, like me anymore. 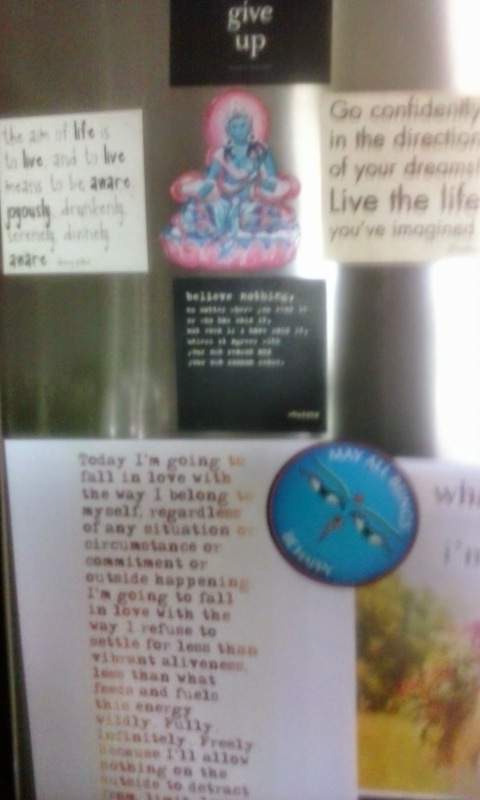 The thing is all those quotes and pictures are things I read whenever I open the fridge or stroll through the kitchen. sometimes while I am sitting over at my office desk I will glance into the kitchen and read something off the fridge to inspire me or ground me. When my youngest son moved overseas I printed out an A4 sized pic of him and placed it on the fridge because I missed him. Soon my husband ( who is notorious for coming up with nicknames) started refering to him as FridgeBoy: "Have you heard from FridgeBoy recently?" I guess my fridge is a bit like a mini vision board or collection site for all my current interests. My shower is another place for me to gather my poems and quotes. This is where I post quotes to inspire me for the morning or prayers that I am working with. In fact, if I really break it down my whole home is full of altars and vision boards, places to savour the word in all its many forms - quotes, poems, intentions and prayers. What prayers keep you going? Is there a quote that you carry with you or have somewhere in your home? Is your fridge a door of awesomeness that you renew as the mood takes you? If it is I would love you to share it on Instagram with the hashtag #doorofawesomeness so I can check it out. In the meantime Sign Up for my newsletter to keep up with all the new stuff I have coming for you.